Dothan, AL – The new Dothan High School Wolves have found their first leader on the Gridiron. The Dothan City School board officially approved Hazel Green’s Smitty Grider as the school’s first head coach Wednesday night in the Circle City. The new Dothan High School will be a consolidation of the current Dothan High and Northview High Schools. When the combined school, which will be located on the current Northview campus, opens its doors in the fall of 1999 it is expected to be the third largest high school, by enrollment in the State of Alabama. Grider, a Montgomery native, spent last season at Madison County’s Hazel Green High School, in his only season at HGHS he lead the Trojans to a 4-7 record, including a 4-1 mark in 6A region 8 play and the program’s first trip to the playoffs since 2015, the Trojans played host to a postseason game for the first time in school history. 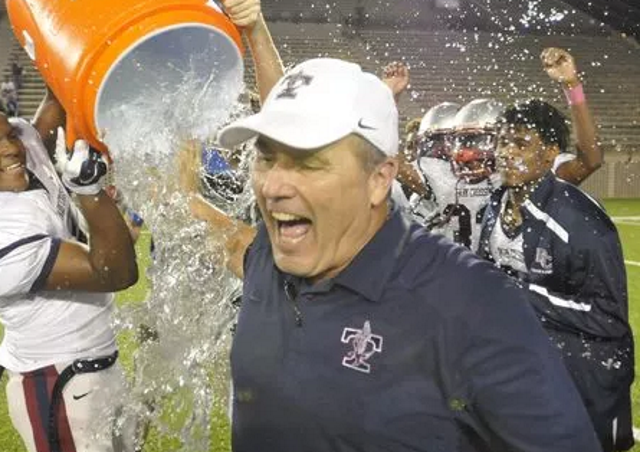 Before accepting the Hazel Green job in 2018 Grider served as the first head coach Montgomery’s Park Crossing High School, guiding the startup Thunderbirds to a combined 38-9 record including three consecutive region crowns and postseason appearances. The Thunderbirds advanced to the AHSAA 6A semifinals in 2016 before falling to eventual state runner-up Opelika. From 2006-2013 he lead the Beauregard Hornets to a 64-28 record over 8 years, advancing to the playoffs seven times and claiming a region crown and a class 4A quarterfinal appearance in 2012. The Jeff Davis High graduate served as an assistant at Smith’s Station and on legendary coach Spence McCracken’s Opelika Bulldogs staff for eight years before accepting his first head coaching job at Central-Coosa in 2005. During his lone season in Rockford he lead the Cougars to a 5-5 record, the program’s best finish in four seasons. Dothan High finished 2018 at 3-7, in Wayne White’s first season, Northview is coming off a 5-5 campaign in Josh Parrish’s second year at the helm of the Cougars.